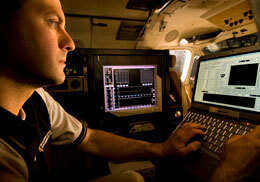 Research Scientist Matt Burkhart calibrates instruments in the King Air, the University of Wyoming's uniquely-instrumented research aircraft. The National Science Foundation awarded UW $470,000 to upgrade the aircraft. The University of Wyoming has reached the $10 million mark in federal stimulus funding allocated to the National Science Foundation (NSF), the National Institutes of Health (NIH), the U.S. Department of Energy (DOE) and other federal agencies to energize competitive research projects at major universities across the United States. In all, UW has received notice of 21 awards in areas of advanced scientific research, scholarship advancement and outreach -- ranging from nearly $5 million to advance UW's efforts in carbon sequestration to about $13,000 to enhance the mission of the Wyoming Conservation Corps (WCC). Three of the university's applications have not been finalized but the DOE has selected UW for negotiations, a step that leads to award, says Bill Gern, vice president for research and economic development. "Our success in competing for research funding supported by federal stimulus demonstrates UW's growing leadership in health, energy, environment and other multiple areas of basic research," Gern says. "The research awarded to date will result in a variety of positive outcomes for UW, Wyoming and the nation. It contributes to the nation's understanding of complex scientific questions, advances options to address critical economic challenges, bolsters the state and local economies in a tough fiscal environment and contributes to the training and education of tomorrow's workforce." The DOE awards include the university's largest grant of $4.975 million, plus an additional $994,910 to help establish the Wyoming CCS Technology Institute (WCTI) in the UW School of Energy Resources and $274,958 to train students in new carbon dioxide separation technology. The WCTI will draw upon UW's extensive carbon sequestration expertise to address the critical need for training of a professional workforce of geoscientists, engineers and site developers and help advance the United States' position as a leader in addressing climate change by reducing carbon dioxide emissions. In addition, UW has received 11 grants from the NSF, five from the NIH and two from the Corporation for National and Community Service (CNCS). The largest of the NSF awards, one of seven announced by UW in August, is for $586,581 to help stimulate research on various aspects of climate change. The second-largest NSF grant, $470,000, will be used to upgrade UW King Air, the university's uniquely-instrumented research aircraft with numerous specialized external sensors and data recording equipment. The top NIH award, of $273,100, also announced in August, will be used to further study into the glycosylation pathways in insect cell systems. The CNCS awarded a pair of $12,871 grants to UW, one of which will support the WCC, which completed its third year of work this summer. The program provides young adults in Wyoming with important personal, technical and leadership skills and experience in natural resource and environmental career fields through a diverse array of hands-on projects focused on improving the state's public lands. The 21 UW awards come on the heels of another record-breaking year for external funding at the university. UW received a record $81 million in external funding in the 2008-09 fiscal year, marking the 23rd consecutive year that the UW Office of Sponsored Programs has reported an increase in external awards by faculty, research scientists and administrative personnel.